If you’re looking to take this flight now, most likely the in-flight experience will be different to the one we had, so I won’t go into a heap of detail on the seat, aircraft and cabin beyond the images. 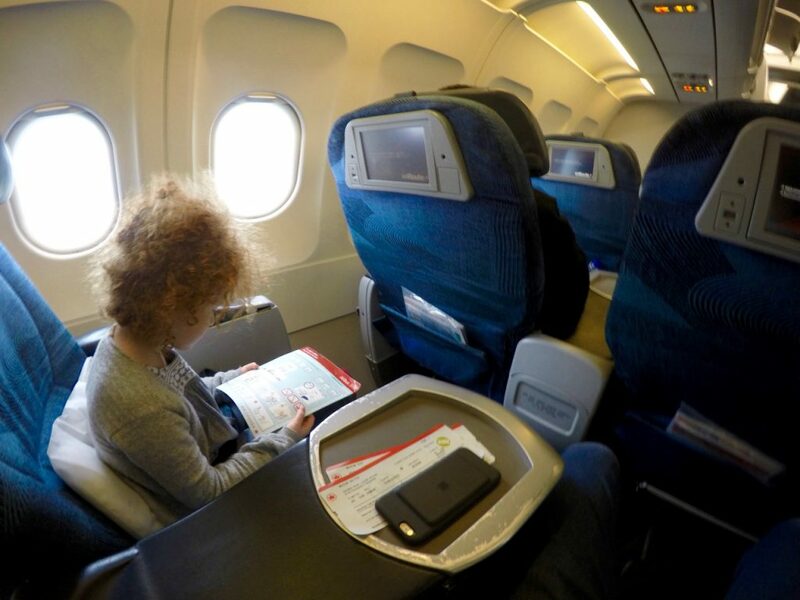 I had a somewhat flexible window for our travel dates of around 4 to 5 days, but with four award seats needed, and not much availability, we ended up having to split myself, partner, and our daughters across two flights on consecutive days. Air Canada flights, as a Star Alliance partner, can be redeemed for using the most accessible currencies to Australians & Kiwi’s – either earned KrisFlyer miles or (probably purchased) United Miles. In my case I had a small stash of United Miles to use up, and then transferred the rest from KrisFlyer – where East<->West coast flights within the US and Canada represent one of the better value redemptions on the KrisFlyer award chart. Given the United MileagePlus miles were purchased for a little under 2.3c NZD per mile, this had a one way ticket equate to around $575. Paid economy tickets on the same flight were coming in above $375 NZD, and I figured the premium in this case was just about worth it – and the miles were just sitting waiting to be used, so to me this felt like a good enough reason to use them. Booking the flights with KrisFlyer required a phone call, while with United could be researched and completed online. I used the United website to look for award availability in both cases. 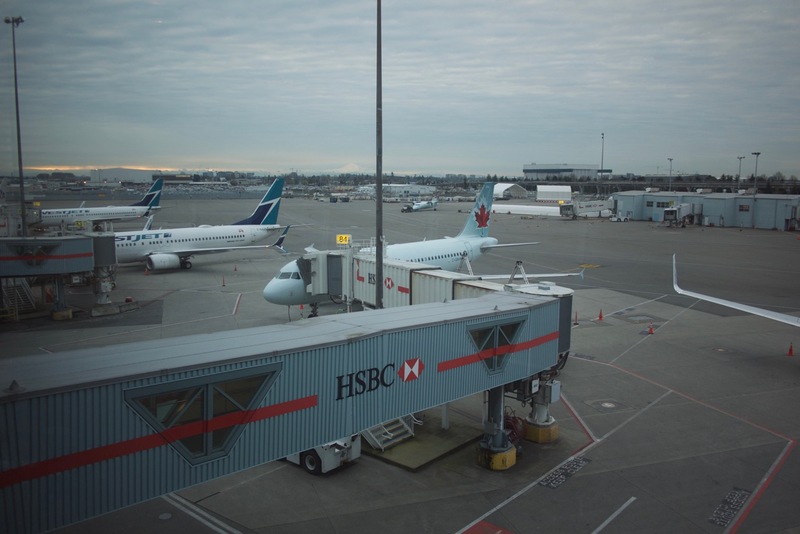 There are three Maple Leaf lounges in Vancouver – Domestic, International, and this one, the Transborder lounge for flights between Canada and the US. 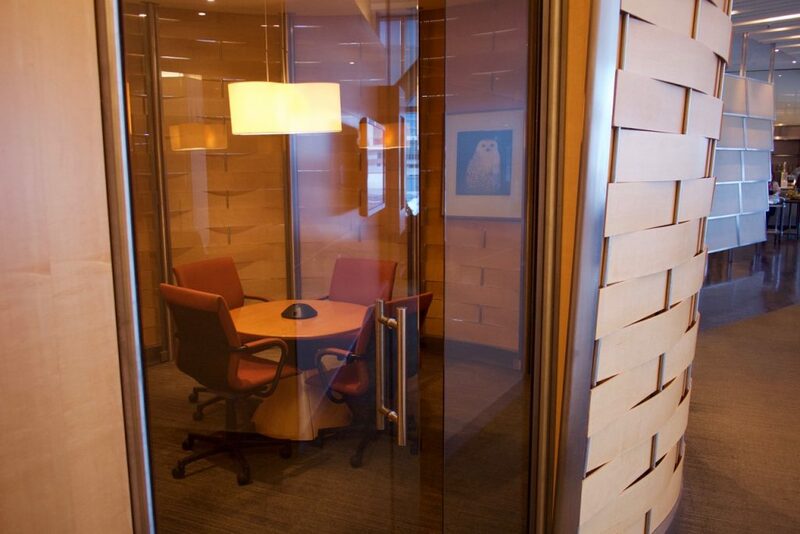 You clear US immigration and security before entering the lounge, allowing you to leave Newark quickly on arrival. However do leave enough time to get through security – it took us about 20 minutes. 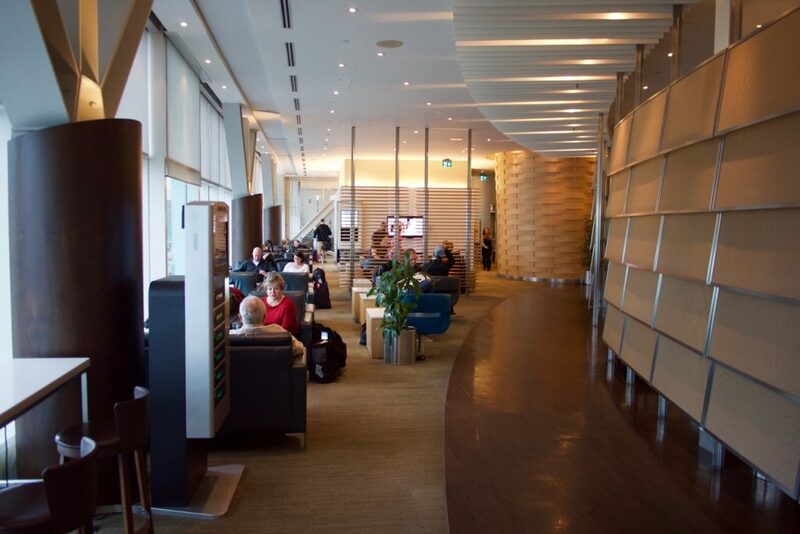 This Maple Leaf Lounge was then about a 5 minute walk through the terminal, and up a level in a lift. 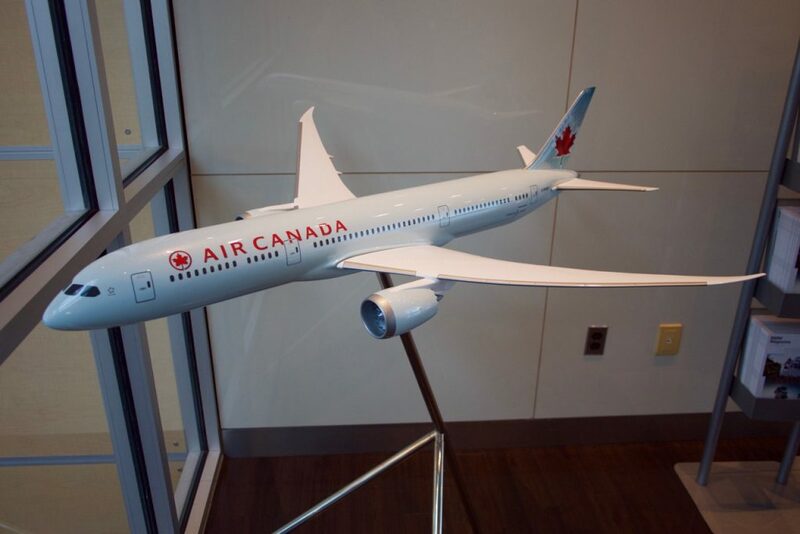 Air Canada have a great brand and fairly modern fleet, being shown off with this model of a 787 in the reception area of the lounge. 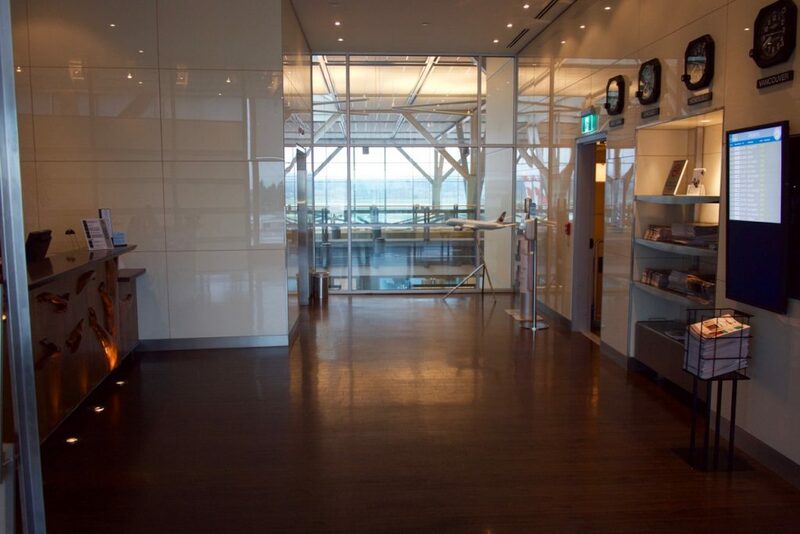 The lounge is configured to maximise it’s position next to large windows along the edge of the terminal, with the majority of seating along the window, and other services – business centre, buffet, meeting rooms and TV area further in toward the main terminal. 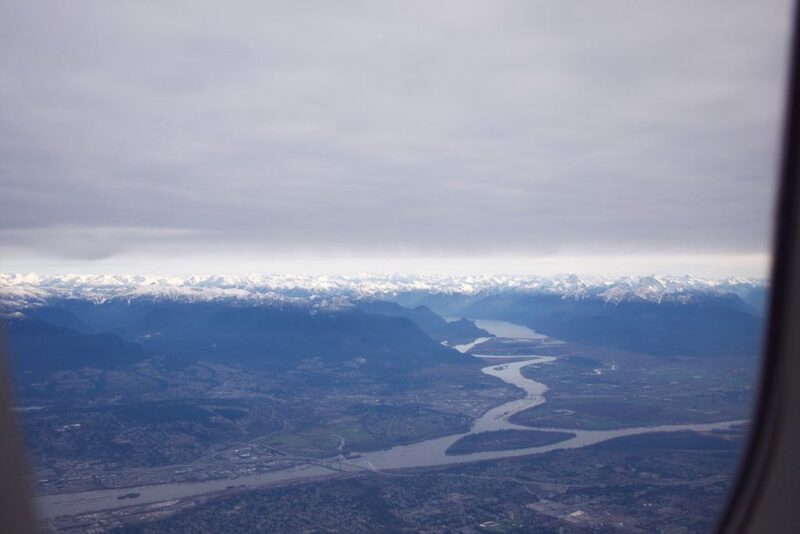 There were some decent views out toward the airport, runways and Vancouver’s impressive scenery. The lounge also had a couple of private rooms that could be used for meetings, or I am assuming, families. If you are travelling with your own crew I would ask and see if you can score one of these for your own and other passenger’s sanity. We entered the lounge around 8am, and had to leave around 8.40 for boarding. 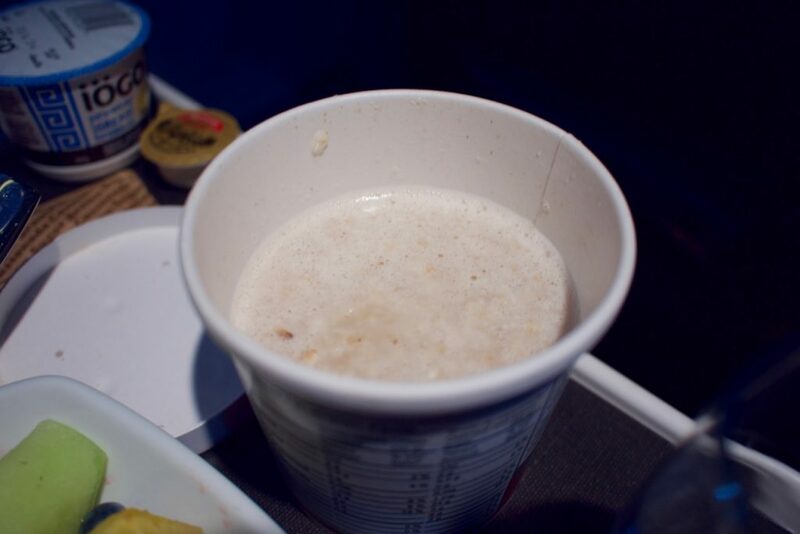 This was just enough time to pick up some relatively standard breakfast buffet items – toast, cereal, milk. The only coffee on offer was straight out of a machine which always seemed to have someone lining up to use it, but otherwise there was plenty of juice and a few other drinks and snacks on offer. It wasn’t impressive, more like functional. Air Canada’s A319 operating this flight had three rows of Business Class in a 2-2 configuration – much like Qantas’ domestic 737 Business Class. 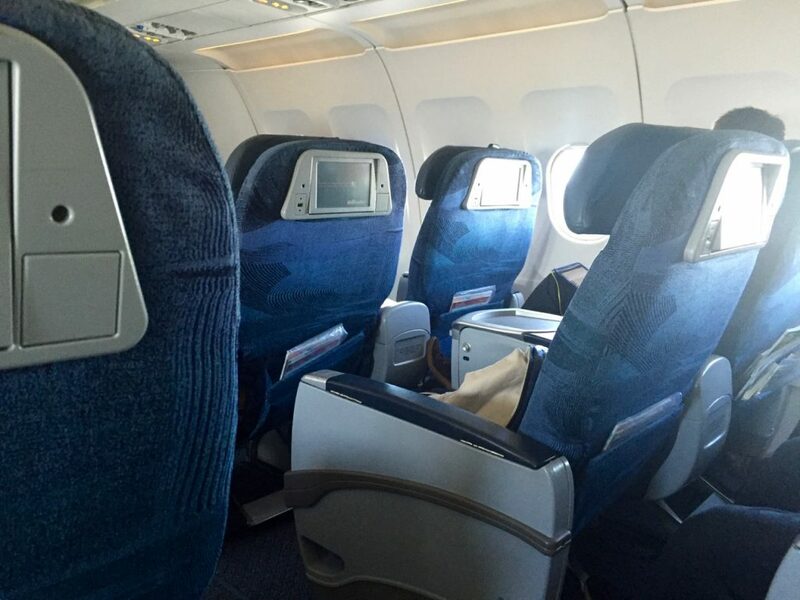 Economy was in a 3-3 configuration just behind us in row 3. My daughter and I had enough space given this was a 5 hour flight, and a couple of windows plus the in flight entertainment kept us from boredom. 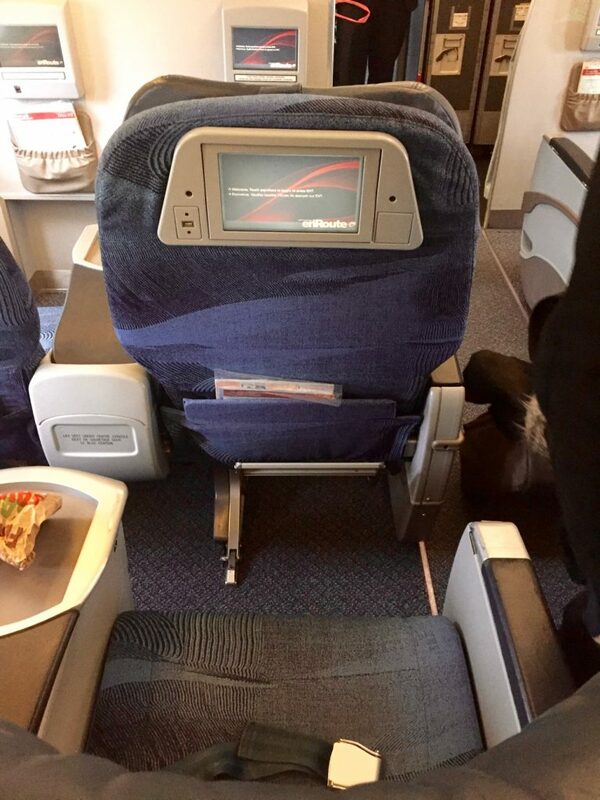 Legroom for me, at 6′ 2″, was acceptable for a domestic Business Class flight. The inflight entertainment system was pretty quirky. 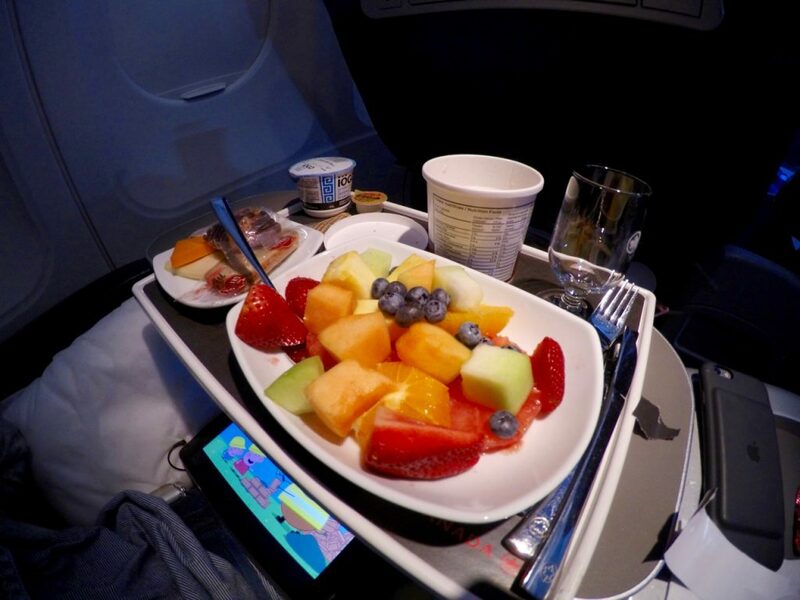 The most important thing – the selection of movies and TV was OK, and enough to keep us both occupied for most of the flight. However the interface was a bit quirky and slow. It worked though, so no complaints. 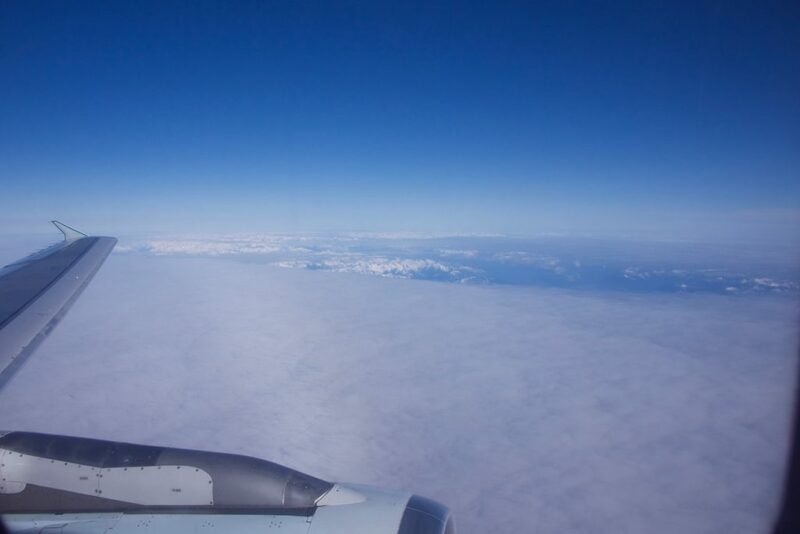 The most entertaining 15 minutes of the flight was take off from Vancouver, with a stunning view from our side of the aircraft as we cut above the mountains, then the surrounding clouds. 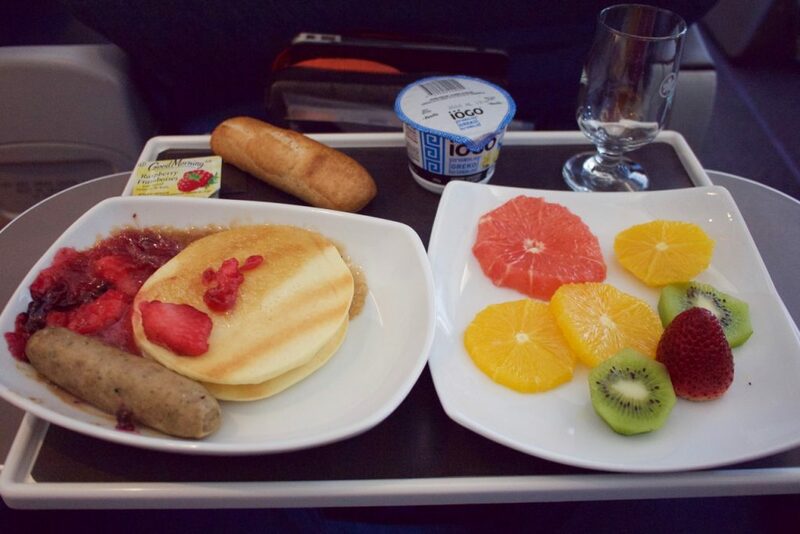 Given the departure around 9am, it wasn’t a surprise that Air Canada opt for a breakfast service on this route. However the flight arrives into New York in the late afternoon, making it not such as simple. Given the options on the menu I would have preferred a lunch service, but I can see why breakfast is offered too. I opted for the sausage and pancakes while my daughter Zoe had the fruit plate, which meant I could take photos of both. The fruit, oatmeal and snacks with the healthy breakfast option were all very tasty. We munched on pretzels and nuts before and after to keep us both going, as both meals weren’t large. The sausage and pancake option tasted good, but there wasn’t a lot to go around. 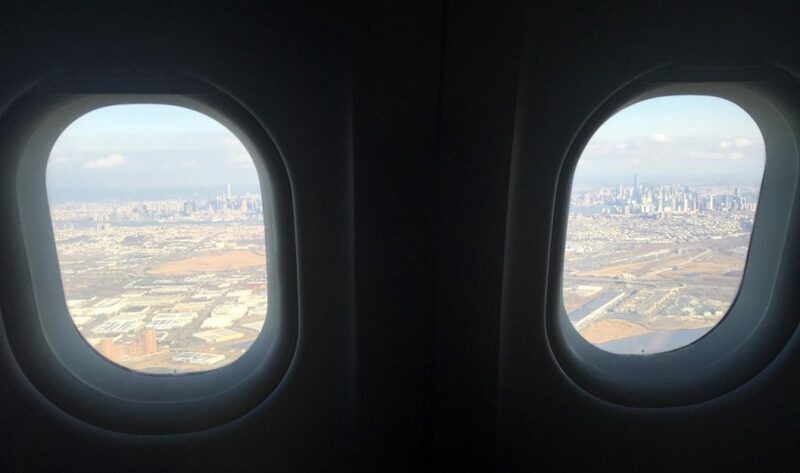 After both getting a bit restless in the last 30 minutes of the flight as we were held over New York, we had some interesting views of the city on our descent and arrived to a clear, warm and sunny Spring New York day. As I mentioned, we selected this flight as it’s the only day flight in between Vancouver and New York. If you’re fine with flying in the evening or overnight then (at the time of writing) there’s a multitude of carriers to choose from as this route is one used by a few international carriers too. 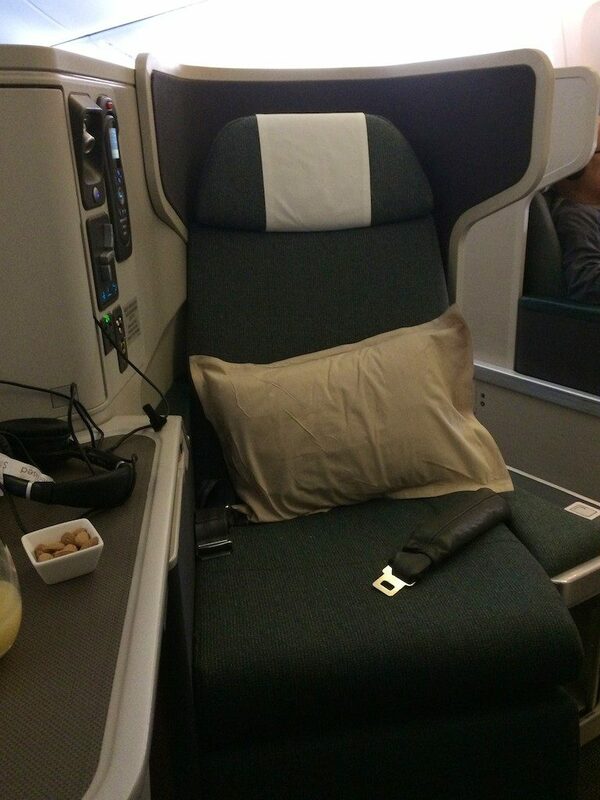 Cathay Pacific Business or First Class would have been my preference if it weren’t for the overnight nature of their flight – this could be had for 42,000 Qantas Points in Premium Economy, 53,000 Qantas Points in Business Class, or 78,000 Qantas Points in First Class. 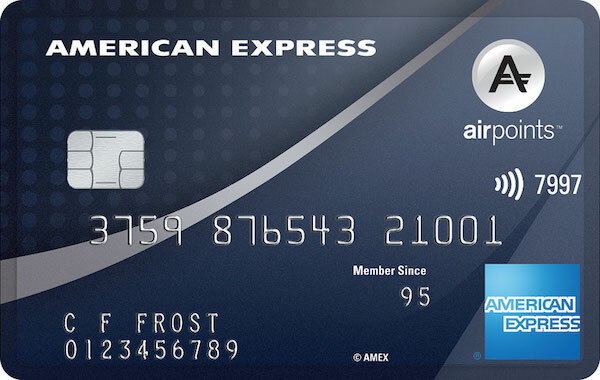 Alternatively you could use 24,000 Asia Miles for Premium Economy, 30,000 for Business Class, or 40,000 for First Class – while both programs are transfer partners with NZ Amex Membership Rewards, this is a great example of the increased value of Asia Miles over Qantas Points. 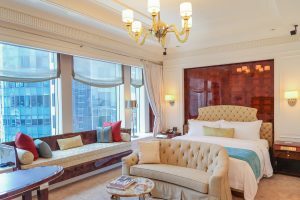 Delta also fly the route directly, also overnight – as a Velocity Frequent Flyer partner this redemption would cost 49,500 Velocity Points in Business Class. Then United also fly their own aircraft on the route with an afternoon departure and late evening arrival. Philippine Airlines also fly the route and is a decent option for purchased tickets instead of using points, usually with the cheapest price when paying cash in both Economy and Business Class. 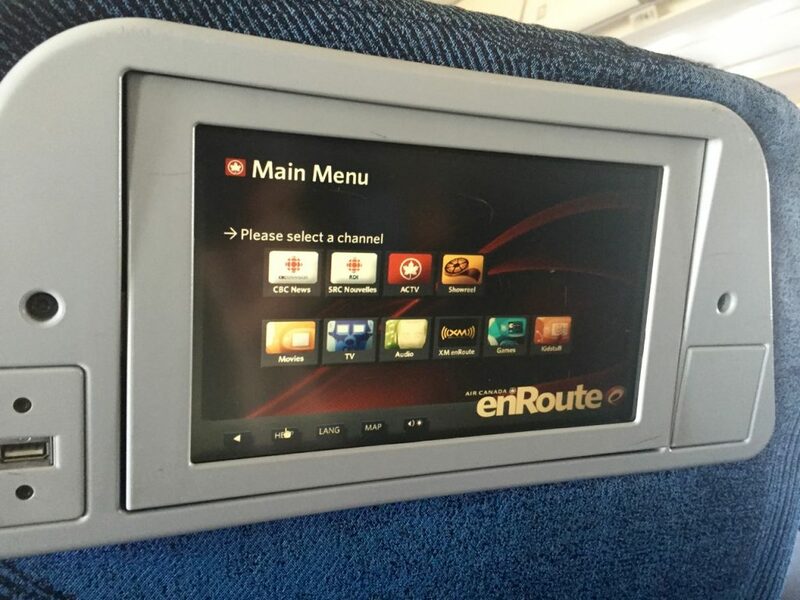 Finally given that Air Canada has now upgraded this direct service to a 787 Dreamliner, it has become a good option for those looking to redeem an award ticket from New Zealand to New York without having to travel on United’s West-East domestic service. If flying Air New Zealand’s 777-200 non-stop to Vancouver then this would be, alongside United, one of the two Star Alliance flights to get over to the East Coast. On Air NZ’s flight however award availability is scarce (at the time of writing) – United.com is showing 2 Air NZ business awards on at least one day in September and three days in October. It wouldn’t be the easiest of redemptions to NYC, however since finding a connecting redemption from Auckland through Vancouver to NYC can be achieved with United MileagePlus for 80,000 miles, the same as required for just the Auckland to Vancouver sector, it could offer an exceptional value opportunity for those with the patience to monitor the option. 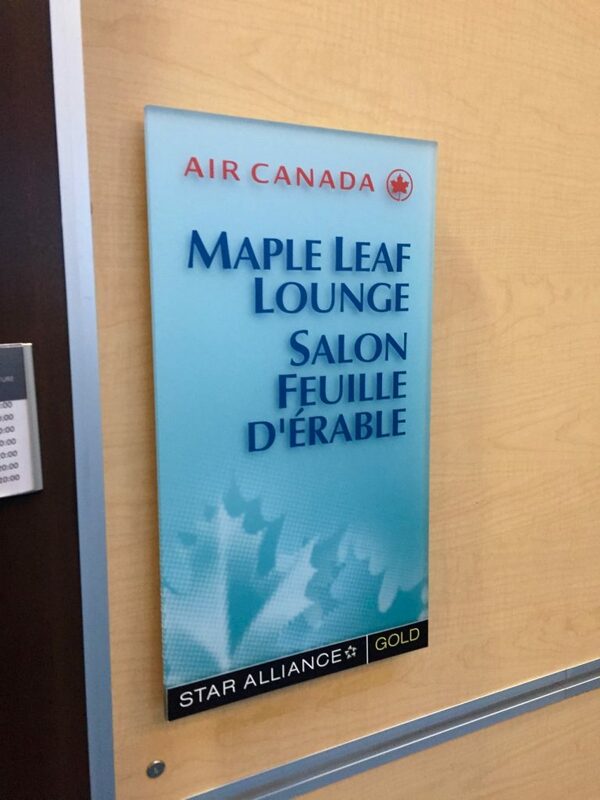 The Maple Leaf lounge in Vancouver was fine, but nothing too exciting. I certainly wouldn’t seek the lounge out to spend extra time here, but the view of the airport and acceptable breakfast on offer made it an OK spot to drop in before departure. 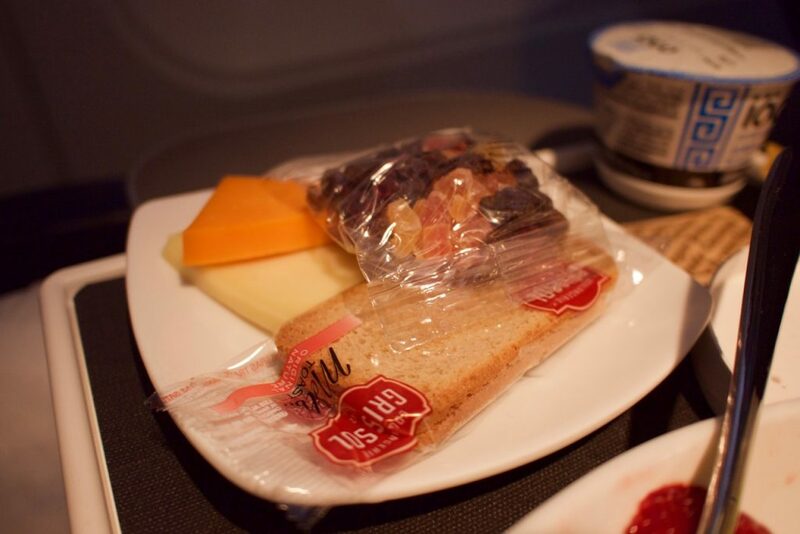 I went into this flight with the expectation that Air Canada would outdo their US airline counterparts for service, the crew on both my wife’s flight and mine definitely lived up to that, with proactive, friendly and positive interactions all round. The food was acceptable – nothing amazing, but totally edible and fine given a flight of this nature and length. 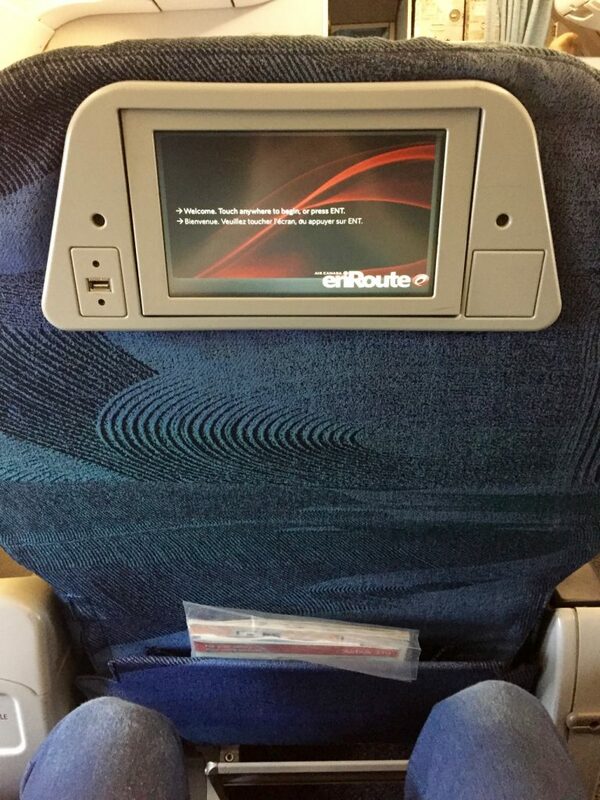 All up, we were happy with Air Canada, and the service was only let down by the ageing and small cabin of this Airbus A319. Given a Boeing 787 is now flying the route, it should be a good experience.